I have tried other supplements without much success. That is until I tried Canes Deer Velvet. My knee joints have had a fair amount of punishment over the years.Since I started on C.D.V I have noticed a more than substantial increase in joint mobility and a massive decrease in the aches and pain associated with it. One of the knock on effects is that I can now sleep through the night and not be woken by sore knee joints….a win win all round. I certainly notice the difference if I forget to take them. DISCLAIMER – Comments on this website have been offered freely by customers who describe their own experiences. 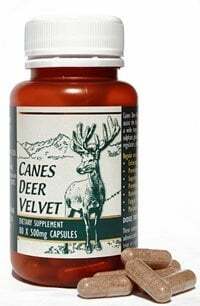 Canes Deer Products make no claim that others will experience the same or similar results by using Canes Deer Velvet. We simply offer a nutritional product and each individual’s response will vary.